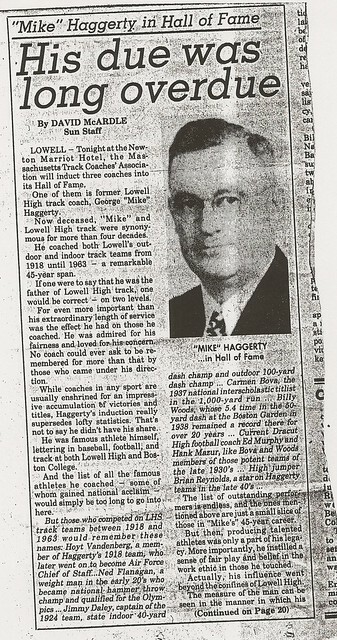 Renowned as one of the leading high school football coaches in Massachusetts at Dracut High School, Ed Murphy’s athletic roots reach back to Lowell High School where his track coach Mike Haggerty considered him one of the greatest athletes he coached in over 40 years at Kirk Street. 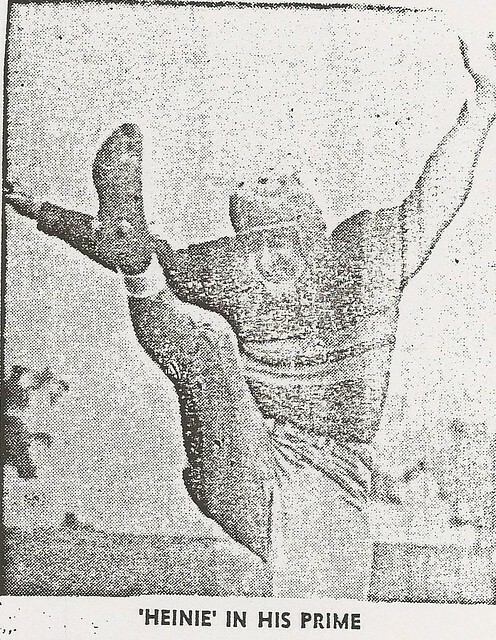 Ed’s prowess on the gridiron gained him 2nd team All-State Honors in 1936. 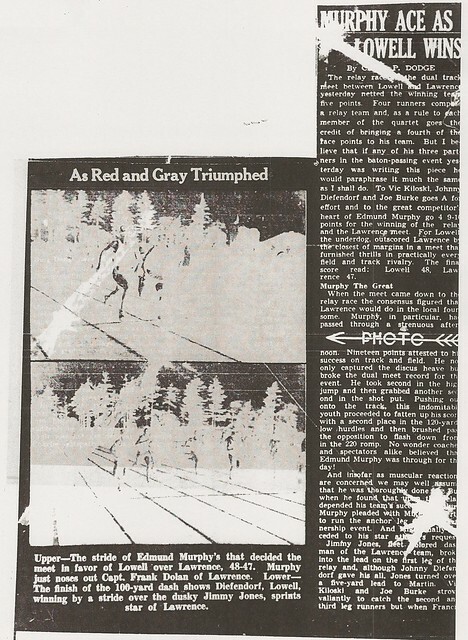 He achieved almost legendary status as a track and field performer for the Red & Gray. A superbly versatile athlete, Ed was a stand-out in the 440-yard (State Champion), shot put, discus, and relays. He was also recognized as a Premier High School Decathlon Performer. 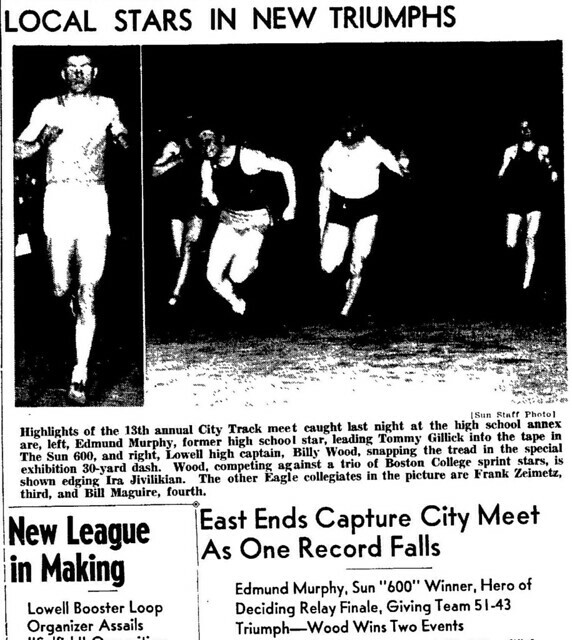 After graduation, Ed attended Seton Hall Prep School in New Jersey starring in football and track. He was a member of the school’s National Prep Champion Medley Relay Team. Ed matriculated at Holy Cross in Worcester and again stood out in both football and track. 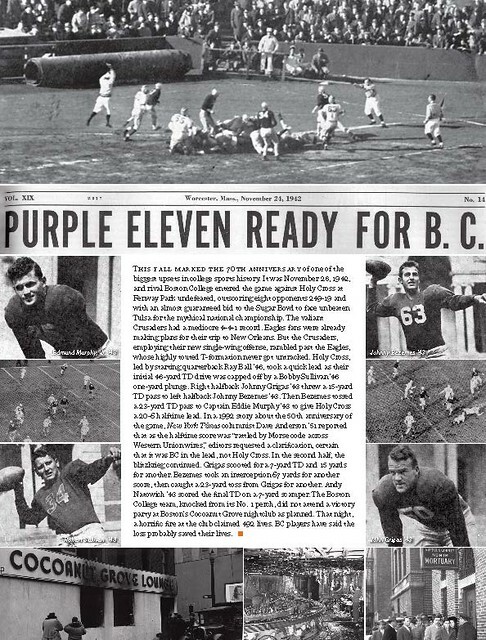 As an end and place-kicker, he captained the 1942 Crusader Eleven that stunned Orange Bowl-bound Boston College. He gained 2nd Team All-American Honors that year after achieving All-East status in both 1941 and 1942. 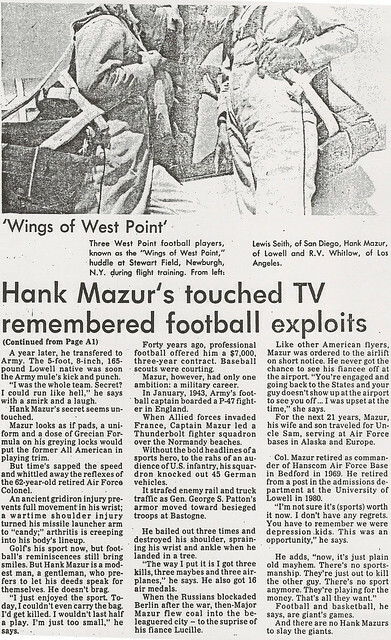 He finished his college career at the East-West Shrine Game in 1943. 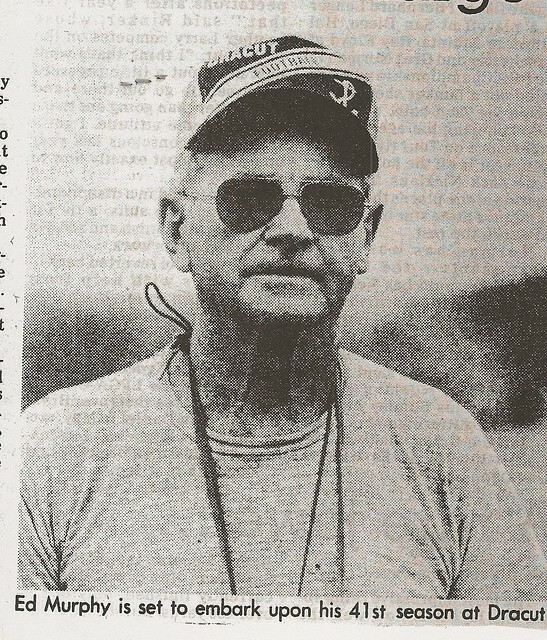 After serving with the U.S. Marines in the South Pacific during World War II, Ed embarked on a successful coaching career at Dracut High School. 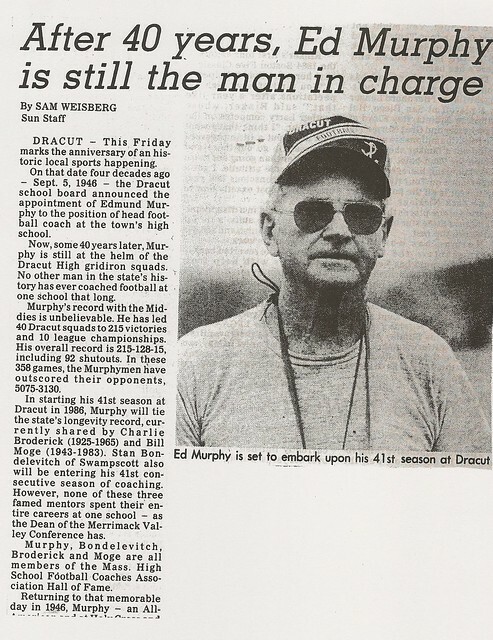 Continuing the versatility he displayed as an athlete, Ed coached baseball, boys and girls basketball, track, and of course, football at Dracut, as well as serving as the school’s Athletic Director. In over 40 years at the helm of the Middies Football Program, Ed’s success has gained him local, statewide, and national notoriety. 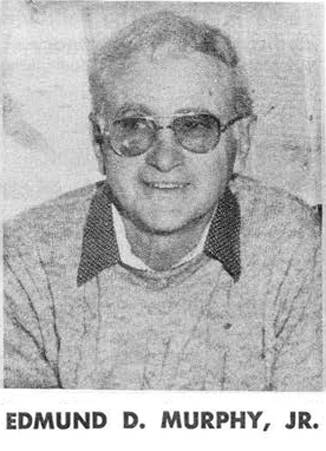 He was elected to the Massachusetts State Football Coaches Hall of Fame in 1982. Murphy’s Law: You’re never too old to go for the gold. Sports legends his age are usually resigned to telling stories of long-ago glories. Seventy years after graduating from Lowell High School, though, Edmund D. Murphy Jr. has fresh victories to recount. In March, the 87-year-old Murphy — a member of the Lowell High School, College of the Holy Cross and Massachusetts High School Football Coaches halls of fame — won the shot-put and discus competitions in his age group at the Charlotte County Fit for Life Games in Port Charlotte, Fla. According to Murphy’s proud son, Dan, his father threw an 8-pound, 8-ounce shot put 30 feet, 9 inches, and threw a 2-pound, 2-ounce discus 99 feet, 4 inches. Both throws qualified Murphy for the Florida Senior Games State Championships in early December. “Big deal,” says the elder Murphy with a modest laugh, his training consisting of cutting grass and picking up dead tree limbs in his yard on Fiske Street in Tewksbury. He and Justine, his wife of 62 years, live in Florida during the winter. Murphy for years was tempted to sign up for the Fit for Life Games. His competitive fires continued burning, so Murphy this year paid $15 in entrance fees and proceeded to win two gold medals. Should anyone be surprised by anything Murphy does in his extraordinary life? He is one of the greatest athletes ever to come out of Lowell High School, one of the 10 original inductees into the LHS Hall of Fame. 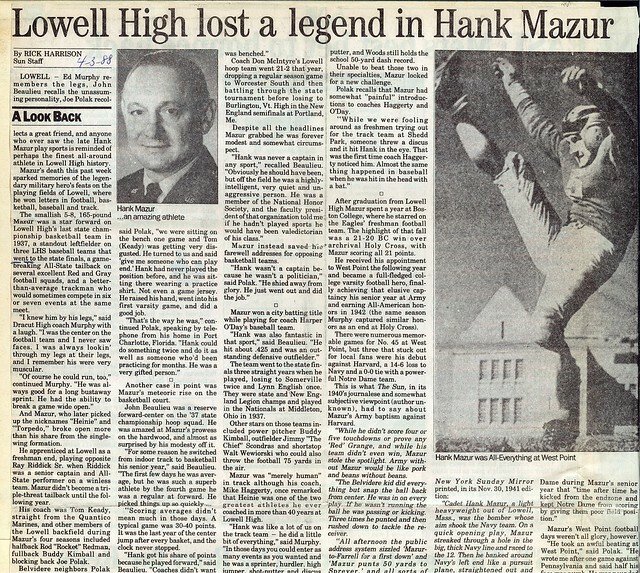 He captained Holy Cross to one of the most famous upsets in college football history, a 55-12 rout of previously unbeaten Boston College in 1942. He signed up for the Marine Corps eight months before Pearl Harbor. 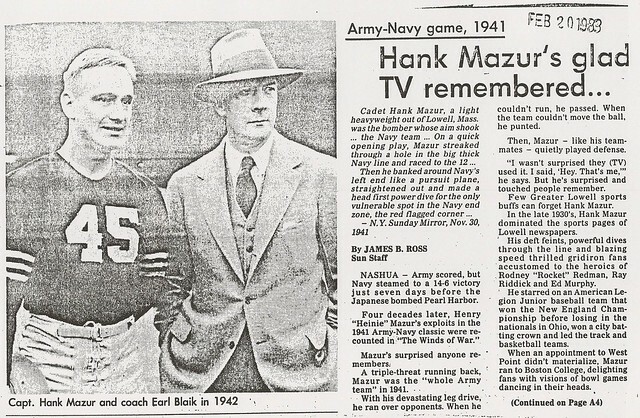 His orders arrived while he was in San Francisco to play in the East-West Shrine Game on New Year’s Day 1943. Off to war he went, serving with the First Marine Division as a second lieutenant in the bloody battles for Peleliu and Okinawa. When the war ended, Murphy was sent to North China to repatriate Japanese troops. The Marines skirmished with Chinese Communists. “We lost a lot of Marines that way after the war,” Murphy recalls. 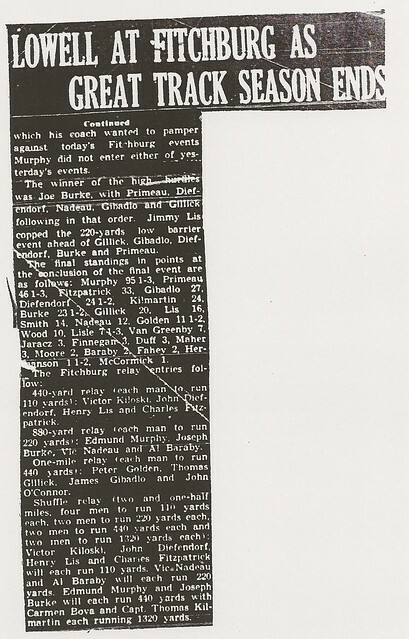 Murphy came home in April 1946 and went to training camp with the Pittsburgh Steelers that summer as an end. He played in one exhibition game before leaving pro football to start a family. Only two other competitors signed up in the 85-89 age group, so Murphy was lumped into a group that included athletes as young as 75. Even with a sore shoulder, Murphy out-threw his competition. 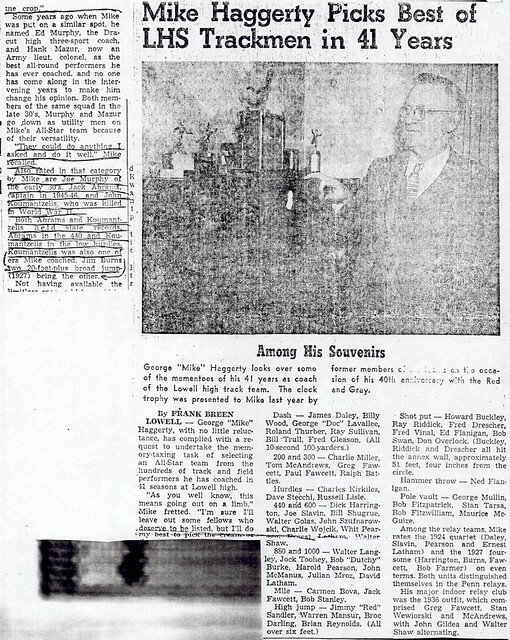 While a decathlete at Seton Hall Prep in 1938, Murphy often threw a 12-pound shot put 50 feet. He competed in track for two years at Holy Cross. Nearly 70 years later, he was again throwing a shot put. “I just stood there and threw it,” says Murphy. “I figured if I turned around twice (before throwing it), I might never get up.” Murphy says he fouled on one discus throw that was longer than his 99-4 winning throw. “I had a memory lapse,” he says. “I walked out of the circle from the front. I fouled. Murphy is not expecting to be back in Florida in time to compete in the Florida Senior Games State Championships in Cape Coral in early December. Not as long as there is football to be watched in this area. Another member of the Class of 1943, Murphy was a teammate of Bezemes in football and also lettered in track. 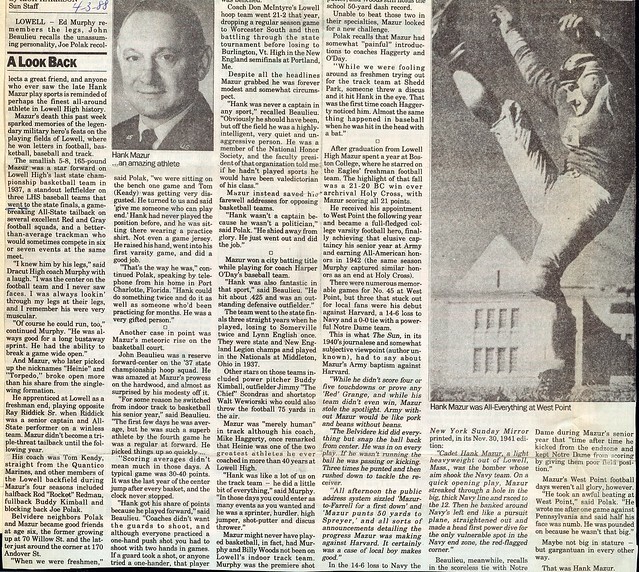 He captained the 1942 Crusader football squad and teamed up with Bezemes on a touchdown pass and also kicked seven straight PATs in the win over Boston College. He was also instrumental in wins over Carnegie Tech and Temple and later played in the East-West Shrine Game in California. He also earned All-East and All-New England plaudits and completed in five events on the HC track team. He has been a teacher-coach at Dracut High School and two of his sons, Ed and Dave, have played football at Holy Cross. Dave is a quarterback on the present Holy Cross club. WORCESTER, Mass. 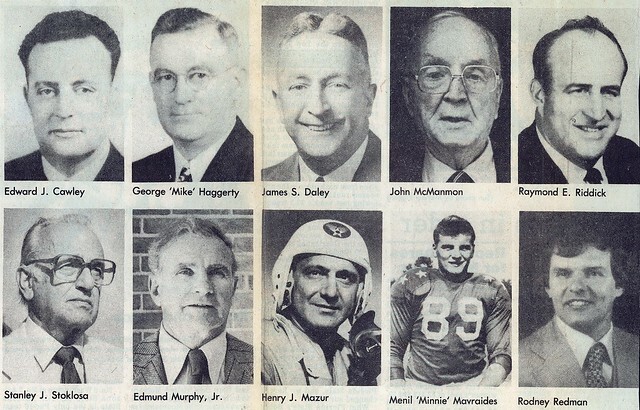 – The athletic department at the College of the Holy Cross has announced that six former football standouts will be honored this fall, as the inaugural class of the Crusader Football Legends Ring of Fame. 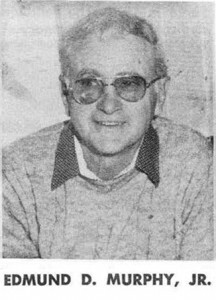 Gill Fenerty (Class of 1986), Gordie Lockbaum (Class of 1988),Edmund Murphy (Class of 1943), Bill Osmanski (Class of 1939), Vince Promuto(Class of 1960) and John Provost (Class of 1975) will all be honored in a ceremony at the 2010 homecoming game against Fordham on Oct. 2, and receive permanent recognition at Fitton Field. Only former Crusader football players who have been elected to the Holy Cross Varsity Club Hall of Fame are eligible for this honor. The inductees were selected by a committee including representatives from the Holy Cross Athletic Department, the Gridiron Club Leadership Council, the Holy Cross Varsity Club and the Holy Cross Development Office, along with fan voting on www.goholycross.com. 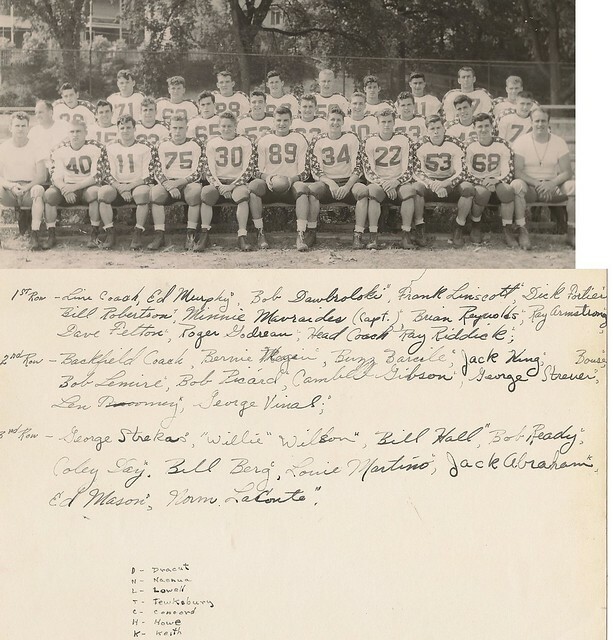 Murphy captained the 1942 Holy Cross football team that achieved perhaps the program’s most famous victory, the 55-12 upset over Boston College, which also snapped Holy Cross’ three-game losing streak in the series. 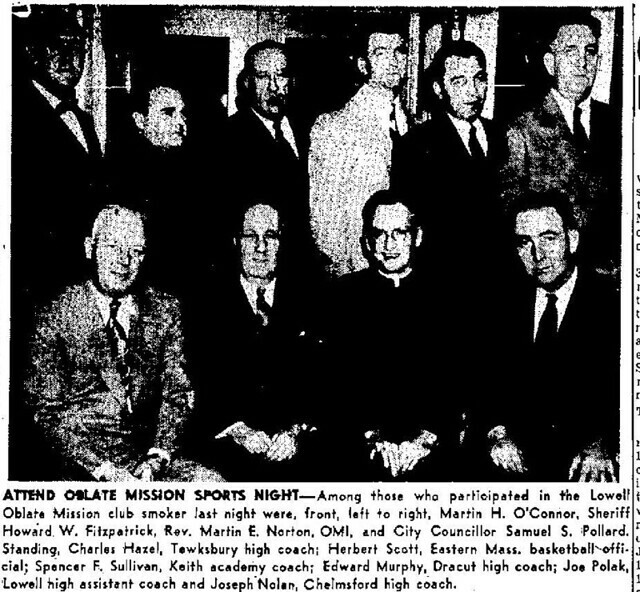 His efforts during his career were also instrumental in victories over Carnegie Tech in 1940 and Temple in 1942, and he was recognized with an invitation to the East-West Shrine Game in California. He was honored as All-East and All-New England in his senior season. 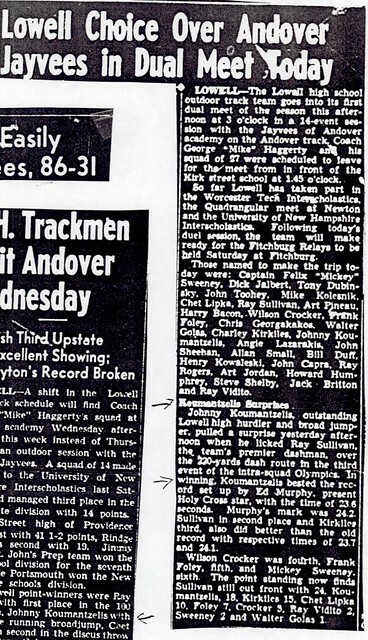 Also a competitor in five events on the track team, Murphy became a teacher and coach at Dracut High School. Two of his sons, Ed (Class of 1970) and Dave (Class of 1982), also played football for Holy Cross. 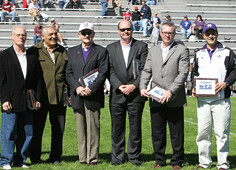 Six former football standouts were honored in a pre-game ceremony at the Oct. 2 Homecoming matchup between Holy Cross and Fordham. The inaugural class of the Crusader Football Legends Ring of Fame includes John Provost ’75, Vince Promuto ’60, Edmund Murphy ’43, the late Bill Osmanski, D.D.S., ’39 (whose award was accepted by his son, Bob Osmanski), Gill Fenerty ’86 and Gordie Lockbaum ’88. Only former Crusader football players who have been elected to the Holy Cross Varsity Club Hall of Fame are eligible for this honor. 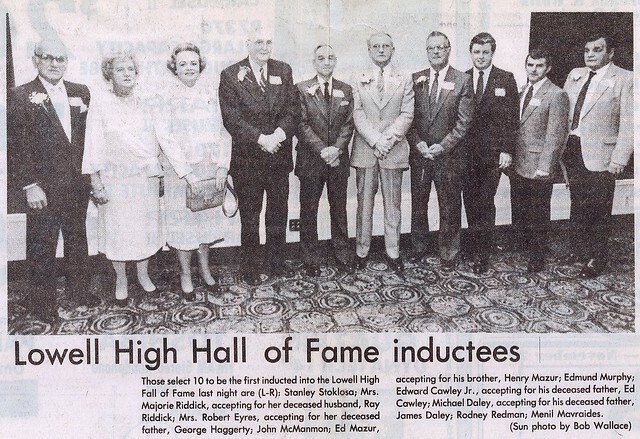 The inductees were selected by a committee including representatives from the Holy Cross athletic and development departments, the Gridiron Club Leadership Council and the Holy Cross Varsity Club, along with fan voting on goholycross.com.